The Mom Standard: Black Friday-Cyber Monday! Want $50? Get it from Dominicks. Read how. Black Friday-Cyber Monday! Want $50? Get it from Dominicks. Read how. 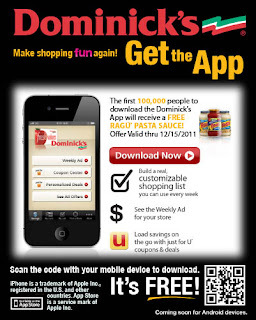 Dominick's has a new mobile application that will save you time and money! It is very user friendly (aka dummie proof) and you no longer need to schlep to your home computer to get on your Just for U account to download all the deals. I don't know about you but between my phone and my Xoom, my laptop has been collecting some major dust. Great, now I feel sorry for it like its a puppy looking at me through the dirty plexiglass window of a pet store its eyes saying "I know I'm from a puppy mill but I deserve to be loved too". Damn! Shake it off KimD, shake it off. So, now that you're all stoked to get this app, get all goosey to win a $50 Gift Card from Dominick's for downloading it! Oh yeah baby! Trust me, you'll like the app. Heads up, the only beef I have is that I can't scan my phone at the check out, I still have to find my Just for U card at the register...if you've seen the bags I carry (not just the ones under my eyes) you'd totally understand. Psst, Starbucks Mobile lets you use your phone to pay...it rocks! 3. Leave a comment on this post that you did 1 and 2 AND what you like about the app! I'll post the winner on my Facebook Page Tuesday! Lots of FB like for The Mom Standard. I'm loving it this Dominicks' free app! Sure makes me more willing to go the extra distance to save at Dominicks. Thanks for hosting this great giveaway!